The press release relied on some wishful thinking. Oakland Community Action Network, a small community group headed by resident Wilson Riles, hoped to take advantage of Wednesday’s filing deadline to influence the conversation in the upcoming mayoral election. They invited candidates to talk about creating a local currency in Oakland. “Each will speak briefly on their candidacies and their support for the Alternative Currency for Oakland Residents and Neighbors (ACORN),” wrote the group in its press release. But the candidates didn’t exactly stick to the plan. It’s an idea that has caught on in other cities and regions worldwide, but implementing the money – which the group wants to name after the fruit of the oak tree and not a political group popularly slammed by Fox News – wasn’t really in the forefront of the mayoral candidates’ minds. As a man practiced Qigong exercises and a vagrant finished up a breakfast of crackers in front of City Hall, six candidates for Oakland mayor and their respective entourages arrived to participate in the Oakland Community Action Network event, basically just a podium and microphone facing the building. All told it was a group of about 80 people, including candidates, supporters, press, and children. At least twenty of the attendees were too young to vote; candidate Terrence Candell brought several young supporters and candidate Larry Lionel Young, Jr., a teacher, brought his class, outfitted with signs supporting his candidacy. Before the speeches began, Zachary Running Wolf, a 2008 Berkeley mayoral candidate, waved a bunch of burning sage to consecrate both the podium and Wilson Riles’s head. Riles didn’t speak about the currency. The six candidates, most in suits, were ready to take advantage of their respective three minutes in front of a smattering of local TV cameras and reporters, but most were uninterested in focusing on currency or the Oakland Community Action Network. They talked in broad strokes and platitudes about Oakland and its problems, and they elaborated upon their own qualifications for the job. Candidate Greg Harland, a local serial entrepreneur, went first. He was against the currency, explaining that the city should instead focus on resolving its “shopper-unfriendly environment,” “not having the right mix of stores,” and parking inferior to Emeryville’s. Joseph Tuman at the podium. Joseph Tuman, a professor at San Francisco State, was neither for nor against the currency, because he’d just learned about the idea. “Until I understand the details of that better, I can’t say I’d endorse that today,” he said. Tuman then went on to rail against Oakland’s “unacceptable” problems, like bad schools and poverty, pausing when the wind caused too much noise in the microphone. “See, God’s agreeing with me,” he said after the sound stopped, looking up. Orlando Johnson, who works with the Oakland Community Action Network and was dressed in unusually-textured green pants, launched into a sweet and heartfelt speech about how he didn’t have a lot of formal education and that world experience should count, adding no one should be seen as fundamentally better than anyone else. He then announced that he was dropping out of the race. Orlando Johnson bows out of the race. “I have touched some 200,000 people,” Terrence Candell boomed after sidling up to the podium to a few scattered cheers, though it wasn’t clear if he meant Oakland residents or another group. Candell was the biggest proponent of establishing Oakland’s own currency, and he said he wanted to do much more, like charging a one percent tax on commuters who work in Oakland but live elsewhere. He also said he wants to add a toll plaza on the East Bay side of the Bay Bridge “so people not only pay for San Francisco – so we can make money for our own city.” Candell was apparently unaware that bridge tolls are administered by the Bay Area Toll Authority and the state agency Caltrans, not by individual cities. Larry Lionel Young, Jr. spoke last, and his supporters mostly appeared to be too young to vote. He supported Candell’s idea of a commuter tax but wasn’t willing to back the Oakland currency just yet. He spoke confidently of the need to help youth. “You can’t police your way out of crime,” he said. He also said he wanted people to really live and function within the city, though it was unclear if he was implying that some people reside in Oakland and do too much living in other cities, or if he was accusing residents of keeping to themselves. “If Oakland is good enough to live in, then Oakland is good enough to live in,” Young said. Both Don Perata and Rebecca Kaplan, considered among the frontrunners in the race, did not attend. After the press conference, candidates and press networked briefly, trying to make sense of what had happened and which candidate was which. Some double-checked that Orlando Johnson had actually dropped out of the race. As the attendees slowly dispersed, a small group of activists handed out flyers reminding people not to forget Oscar Grant. Mayoral Candidates left to right. Greg Harland hugging Larry Lionel Young, Jr., Joseph Tuman (obscured), Terence Candell, Orlando Johnson, Jean Quan, and Donald Macleay. Terence Candell (left) and Larry Lionel Young, Jr. pose with young supporters. Seriously? No wonder Perata and Kaplan didn’t show up. What a joke. Why are you even wasting your time covering such an event? This story made me laugh. Hard. Thank you for covering the event and showing the absolute absurdity that all Oaklanders live with day in and day out. George – I think that’s the very point the author is making. The event got hijacked by a travelling circus of pathetic opportunists. Talk about “Hi Mom, I’m on TV and I want to be a mayor!”. Credit to the two that didn’t sink to this level. Jct: So let’s see how many of these local politicans show any brains. Bad idea. What other cities are doing this? I’ve heard this repeated, w/o any specifics given. Worse event. None of these clowns will get my vote. 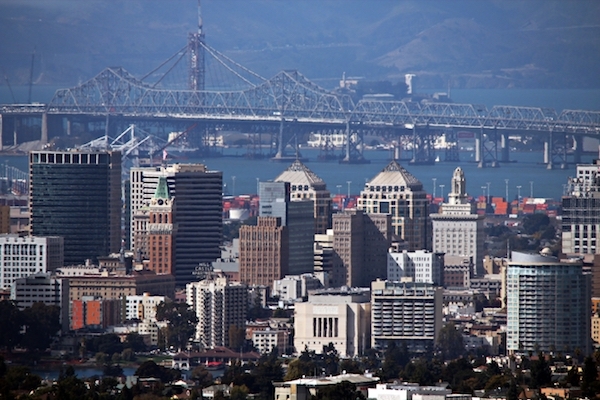 Do any of you Oakland residents (who have) commented have any good ideas for the city? I don’t think the candidates sunk to any low level. They are trying to get in front of voters and talk about their ideas. I bet they had no idea they were going to be asked about an alternative currency. Too bad more people didn’t show up and support their candidate. There are many people who live in Oakland and work around the corner or across the street from this event. I’m wondering if the group hosting this event even did a decent job of announcing the event. Yo Anrica this was incredible. Exactly the kind of local reporting I am interested in. * Diminish crime in downtown by relocating the jail and social services building to a freight ship in the harbor. * Tax the Port of Oakland for their use of city roads. * Restore the economic vitality of West Oakland by relocating the projects that surround the BART station to Marin (where the developers who created them live). * Remove the current catch-and-release judges and DAs – restore moral in OPD. * Explain to OPD’s union that you are prepared to contract private security for the city at half the cost unless they agree to reasonable salaries and benefits, however if a cop choses to live in medium crime district in Oakland, he may keep his existing benefits while doing so. Asked a UCB economics doctoral student friend, his take on the ACORNS. Gave him the links for the organization and related theoretical support. “Regarding ACORNS. I am not exactly sure if voodoo economics is the right way to put it… but I am skeptical. First off, it is not clear exactly how people are substantiating their claims of monetary benefits to the city of oakland. Sure, having some dollars only spend-able in Oakland might force people to spend money locally – but there is no magic free money. It is not as if the city could just start issuing currency; especially since I don’t know who would believe they could back it up when it had to be redeemed. At best, I could see the city negotiating with local merchants to provide a discount for the potential volume of business drummed up. However, economic theory will tell you that any such discount would ultimately just result in raised prices if the businesses are functioning in a competitive environment. Otherwise, we are actually talking about independent currency – and that just seems like a disaster waiting to happen… could you imagine the city of Oakland facing exchange-rate risk or trade deficits with respect to any transactions in surrounding communities? Not good.